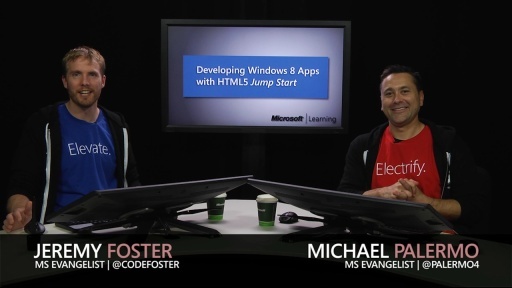 Microsoft Technical Evangelists Jeremy Foster and Michael Palermo kick off this exam 70-480 prep course with an engaging discussion about HTML5 semantic structures. 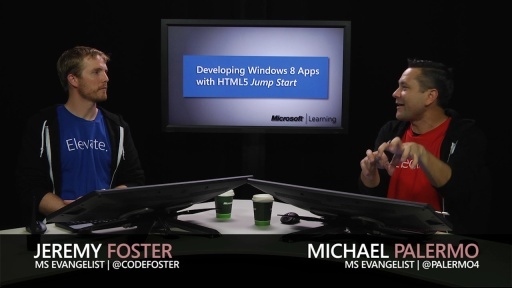 Topics include Semantic tags, Forms, Audio and Video, Canvas and SVG. @Holger1973: Thanks for the feedback! Let us know how the exam goes for you, and be sure to use the voucher code above. Cheers! I tried to use the voucher code to register the exam. but the site showed me an error message "invalid voucher code". Is the supply of the free examination ended? "Exactly. There is no browser. We're actually running ... "
can anyone tell me how i can get voucher code HTMLJMP for registration and resgistration link also. Just went ahead and registered at a location in Ohio. Will give me enough time to go through the videos and samples. First time at Prometric in the states, will see how it goes! Hi. Are there any notes or slides that I can access? That chart of semantic tags is rather long for me to pause the video and copy down the whole thing. 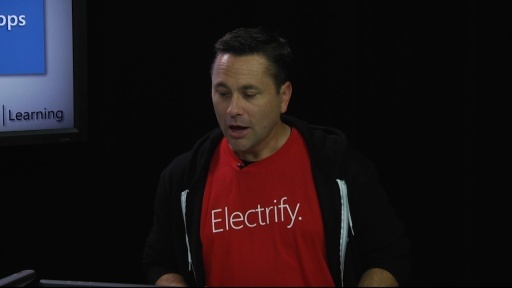 @Mike Kabala: I'll see if I can add the slides to each of the posts a little later today. @parveen: Here's a link to the Prep Guide for the exam: Prep Guide Exam 70-480. If you follow the link there will be a Schedule button to the right on the page. Follow that link and you should be able to register. Use HTMLJMP as a promotion code when you get to that part of the registration process. 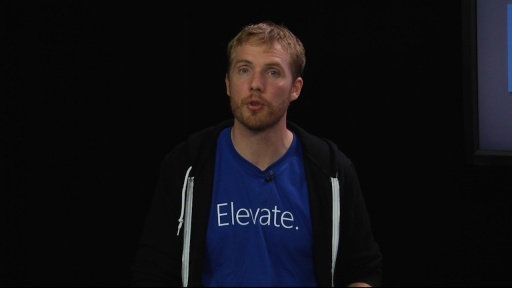 Thanks Microsoft, Jeremy F, Michael P and Jeff Koch, this is a great opportunity to obtain my certification, so with this videos i had and excelent tool to know everything about the exam 70-480, and the best is free!. w00w .. we just watch our x factor .... really nice content thanks . FYI, you guys might want to update your verbiage to indicate the HTMLJMP is a promo code, not a voucher code on the Prometric site. Initially I selected voucher code, but it said it was invalid. When selecting promo code, the code was recognized. Great job! I just watched the first video. It's very cool that you transfer the new stuff in an entertaining way. Great job, and i like style of this cource. Hey Guys just jumping into this. any guide on what i need to do will be great. hope someone replies. cheers.. The player session stops in between. Do any body face the same issue? My IE9 crashes all the time I attempt to start video. You have to select Promotional code not Voucher Code for the discount.. Thanks, gentlemen, good job! And thanks MS for the voucher. Can't wait to start coding apps. Thank you for the content, and double thanks for the coupon!! Thank you Microsoft. 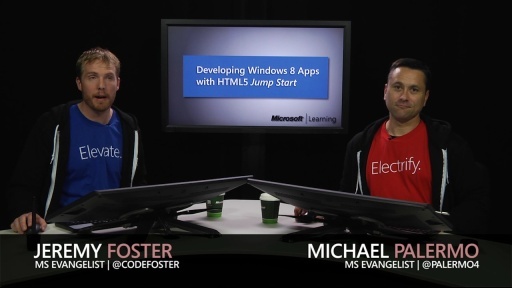 Hey, Thanks folks, promo code worked for me and the course content looks awsome, and pretty excited about HTML5 Apps. Thanks MS. Same thing happened to me with the code ! It says its a voucher code, but its actually a promotion code. So when you type in the code, modify the voucher drop down to promotion. thanks for the presentation guys! hey what do you call the screens that they are using, leaning too much. great video tutorials, and I like the style of presentation. Quick question: Is it possible to get the showed CSS Selector Windows 8 App? Great stuff!! I am having issues viewing the videos though. Is it possible to have documentation in pdf format? Just registered to the exam on 01/07/2013, enough to get well known by the techs! thanks a lot, cheer from Brazil! ahhh...Registered for the exam on 11/12/2012. Hope I'll clear it and get my First Microsoft Certification. Does the video has closed captioned? I am not able to use HTMLJMP code for regristraion at prometic site. Please suggest. just starting to training.Am i to take the exam too on 16.11.2012? no chinese here?why the video have not subtitles? Tor those who have issue, please select "Promotion code" not "voucher code", from drop down list. I'm scheduled, for exam, on December 28. HTMLJMP as promotion code. Please suggest. Thanks for the great "Jump Start". Really great. Great Video !!! Style of presentation is awesome. I'm waiting for my voucher. How can i se the video full scream? It's very useful. I hope there are more interesting things in the next section. Thanks! Hi, I admit, same issue here in Aus that the promo code isn't working, and yes, of course I tried both voucher and promo. Say's it's invalid. Only 100 bucks, I guess work will pay for it either way, but always nice to get something free. Is there section #2 (or day #2 ) mentioned in the last video ? This HTML online course is very intressing, but how does it work? Do I have to learn online and give the exam in an exam centre? Is it free? How can we take this exam free . where we found free voucher ? I have my exam on 12.13.12. I've first learned from there and then I am going to watch these videos. @Mujtaba Roohani, stop learning stuff from w3schools.com, I've seen a lot of inconsistencies in their so-called "tutorials", they're not related in any way to the W3C. You might want to check out w3fools.com, so you can get a better clue of what I'm talking about. 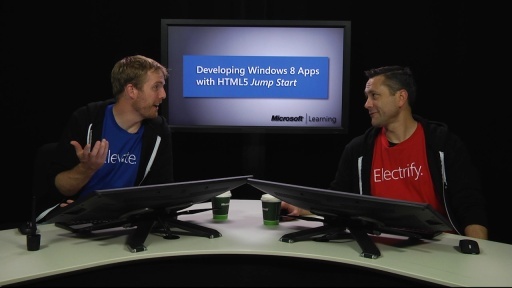 As for this training series, I would like to point out to you that self-closing tags are from XHTML, and in HTML5 you are not required to close <input>, <img>, <meta>, they are only allowed in HTML5 in order to ease the transition from and to XML/XHTML. 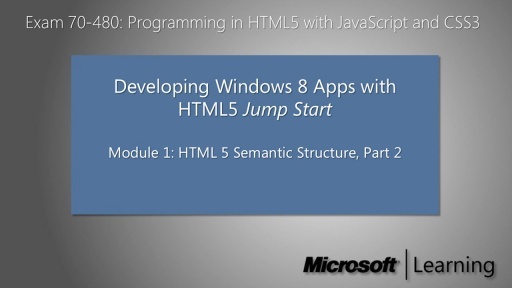 If you want to be, let's say "future-proof", eliminate those self-closing tags because most of the people who are watching these training videos are usually beginners, or front-end developers that come from the XHTML era, and it should be pointed out to them that the / is no longer necessary. My personal argument for the elimination of the self-closing tags is that you'll write 1 less character. Except this issue, I really like your course and I'm going to keep on watching it ! Hi, i really enjoyed to listen your great information. 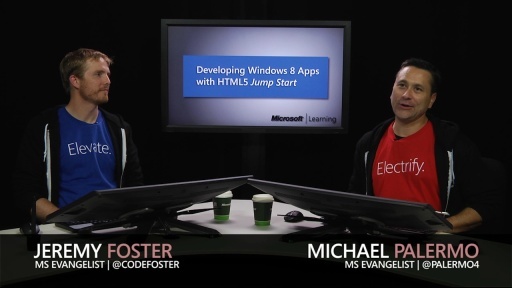 But in my visual studio to create windows store application i did not find any link. Please let me know i am really interested to create now. please I wish to request for downloadable version of these videos to allow study and prepare for the exam. my internet connection is not good enough to allow me watch online. I'm interested in studying the web sockets material but I did not see it on the course material I download. I downloaded all of the mp4 as I find the Silverlight presentation very grainy ad broken in pieces. Thanks for the video segments. Lot of information in these videos. Thanks a lot for sharing these videos. Exam registered for after the new year, time to get my study on. @palermo4 'Where's the browser gone' sounds like something from my tech support job. Is there a link somewhere or ftp repo to download all the episodes at once? Why do I get the feeling that Jeremy isn't happy with Michael? Quick question, what tools did you use for 1) recording the videos 2) zooming in and out 3) drawing boxes and arrows during the presentation? I am a fresher.I wish to do some certifications in HTML and css. Any body help me regarding this and also reg free course and about the examination. (i am a beginner). I tried registering on Prometric site but seems voucher stock is over. I get this message - "The maximum count for the promotion has been exceeded. Please try another promotion." Dear dean, please arrange it more, I'm willing to pass this exam. Just came across the info relating to the course and exam a short while ago. I was really, really interested but I also got the "The maximum count for the promotion has been exceeded. Please try another promotion." message :(. Can you please help with another promotion code. You said the promotion code validity till 3-31-2-2013 but now only it's saying "The maximum count for the promotion has been exceeded. Please try another promotion." Can you please allow us to schedule the exam that promo code, I have practiced really well for this exam. I wanted to write. Where can I find videos/content for day 2? Just came across the info relating to the course and exam a short while ago. I was really, really interested but I also got the "The maximum count for the promotion has been exceeded. Please try another promotion." message. Can you please help with another promotion code?? just wondering, haven't got W8 yet, since... well, is xpensive down here. Is there a way to get licenses for developers? can you please share that file with me? Can you please allow us to schedule the exam that promo code. Or provie a new vocuher code. Yes it said valid until 3-31-2013 and I tried it now in prometric, said "The maximum count for the promotion has been exceeded. Please try another promotion." Any chance to still have a valid voucher code? Thanks! hey thanks guys for the great job that you have been doing am very sure after the course i will become an expert in the course. Can you please allow us to schedule the exam that promo code. Or provide a new voucher code. @Soumya. Plesae enter it as a promo code not a voucher number! After viewing the videos I decided to register for the exam, but it looks like I'm also getting the exceeding message when using "HTMLJMP". Is the promotion still going? Try this promotion code: HTMLMPN. I just went through the site and tried to redeem the voucher. But the promotion code HTMLJMP or HTMLMPN don't work. Can anyone guide how to get the voucher to schedule the exam? HTMLMPN worked for me this morning. Choose promo code, not voucher. I tried to use pormotion code i got an error says "The maximum count for the promotion has been exceeded. Please try another promotion." Yes HTMLMPN is working fine. Will I get the points for this course by downloading and watching or listening offline or do I have to watch the videos online before I can get the points? I seem to have a bit of a "buffering... for ever" problem. The promo code works like a charm. Thanks Mr. Jeremy Foster and Mr. Michael Palermo for your great contribution. Too bad promo doesn't work HTMLMPN. Hey, everyone. It's great to hear from everyone passing exams! There are a number of comments about the promo codes. The promo was an offer "while supplies last", and as far as I know it ran dry. If there are any extensions I'll be sure to let you know here. I have just registered using HTMLMPN. I just made sure I use it as a Promo Code. You can try it. Can anyone tell me how long the exam takes? I'm a first-timer, and I have to travel almost 200 miles by ferry and then by car to get to a testing center. I have not been able to find that info anywhere on this or the Prometric site. I really need to know before I arrange travel, etc. Many thanks in advance. I am scheduled my exams this 31st! You will need to bring two (2) forms of identification to the testing site. One form must be a photo ID, such as a valid passport or driver's license. Both forms of ID must have a current signature. The test will not be delivered without the appropriate form of identification. Please let me know that i have neither passport nor driver's license,, can i appear in the exam with my national identity card only? Scheduled the exam, the heat is on! Great method to teach new technology. Thanks a lot. Hi, what monitors do you have on this video? I cannot reach the codeshow site, it appears to be down. Tried here on IE and Chrome, then my iPhone, all to no avail. Please help! amigo gracias, saludos desde colombia. <input type="phone" /> shouldn't be <input type="tel" /> ? "The maximum count for the promotion has been exceeded. Please try another promotion." please someone tell another code htmljmp or htmlpn not working . Thanks ( Jeremy, Michel , Jeff and Microsoft) and your effort is appreciated. Tutorial was informative. Got 100% (1000 out of 1000) in 70-480. Hey guys, I re-encoded the videos and put them on skydrive. They are the ipad mp4 version! The files are way smaller and its only ~500mb to download each course. I,ve tried, and yes, i've picked "promotion code" from the dropdown, but it says "Promotion not found". So is it still valid or only some countries may get this promotion? Great series...Thank you for putting it together. Yep...code is not working, so no exam for me but I learned a lot and refreshed some basics. Hi, where can we see the videos for day 2? Ok, figured it out ... 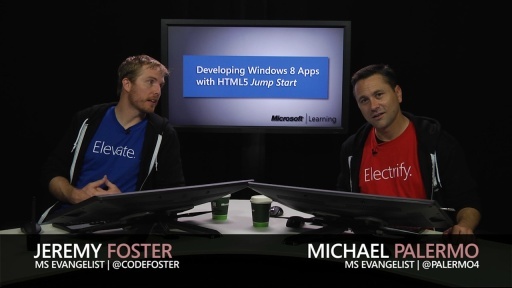 Developing Windows Store Apps with HTML5 Jump Start, linked to above ... but it's not obvious! Got the email for promo code, but promo code is not working any more. The maximum count for the promotion has been exceeded. Please try another promotion. Same here..got an email about the promotion..tried to schedule an exam within 30 minutes...it says promotion not found...tried again today but the same problem...is there any solution friends...help!!! Is posible that you can open a new promotion code??? The others no found more. "The maximum count for the promotion has been exceeded. Please try another promotion." Please provide another promotion code... Please!!!! Is there a possibility for more promotion codes for this exam? Plz give us one more chance to get free voucher!! I have just watched ur video again & again for studying but I have no chance to test for free! I want challenge seriously!! Plz, plz, plz!!! Yes please, give us a chance to get this certification please. Please renew the code so we can register until end of March as advertise. I tried HTMLMPN and HTMLJMP. Bot codes are not working its giving me error "The maximum count for the promotion has been exceeded. Please try another promotion." Can any one help me out? Please provide a working Promotion Code. When I had registered for the course it said promo code is valid till March 31, 2013. I'm sorry about the expired voucher. They said that it had run dry and there were no more vouchers available at this point. I hope this won't keep you from taking the exam. I think it will give you more than it costs you all things considered. As Microsoft always does, they stopped the free code... They just want publicity and thats y they did this. I am not expecting them to give new vouchers as they got their goal. why are you not registering any more students, my more than 10 students was practicing from 2 Months to appear in exam now they finished their studies for 70-480. I've got the voucher code but showing invalid promotion code when am trying to register for exam, Is this because of my location (INDIA) ? Please, give us 1 o 2 days more to trying the examen, I just finished my exam preparation :(. Thank you for nice jump start session. I have passed my 70-480 exam with the help of this session. Can anyone please provide me a voucher code ...i want to give it as soon as possible ..please anybody if knw give me..
Hello, I have finished the course. I think is fun and interesting. Thank you for your work. But I don't agree with the cancelation of the free voucher. Microsoft told that the expire date was March 31, 2013. 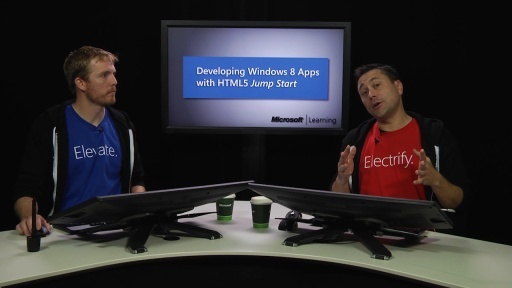 FUNNY.....HTML5 tutorial using Silverlight plug in....hahaha. Microsoft. @Tarang: it works with HTML 5 as well, just depending on what you have installed, browser you are using etc. Fallback is beautiful. I want to download the Video in Any other format then webm that I see currently when I press save Video button. Any updates, when will Microsoft be back with the promotional vouchers. The voucher no more valid!! is there a way to view the codeshow demos in a web browser so web authors can follow along? @dsilvadarius, no, the codeShow demos only work in the codeShow app... not in the browser. This sure looks like a stellar video series. Party w/ Palermo with HTML4 Semantics. I want crying,because of my bad English.....I cannot unstand what they said.Who can help me?